Welcome to the Blue, John Axford! We all knew the Dodgers were looking to add a reliever. We just didn't expect it to be John Axford. 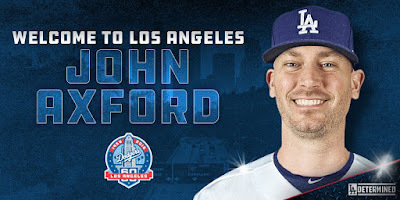 As you likely know by now, in addition to the trade deadline deal that brought us Brian Dozer earlier today, we are also adding right-handed reliever John Axford from Toronto. In exchange we sent the Blue Jays a right-handed prospect named Corey Cropping. Welcome to the Blue, Brian Dozier! Here's a deadline deal no one expected. 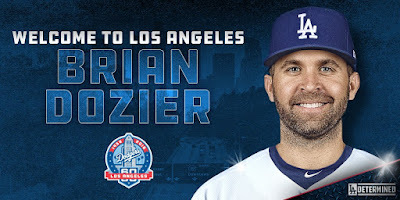 At long last the Dodgers have gotten the infielder many fans had wished for a couple of years back. Unfortunately, he doesn't quite have the stock value he had back then. Today, he's an under-performing player who has a track record that suggest he could turn things around. Announced this afternoon is a trade that sends our second baseman Logan "Logie Bear" Forsythe, minor leaguers Luke Raley and Devin Smeltzer to the Twins for second baseman Brian Dozier. "I haven't seen that one," said Dodgers manager Dave Roberts after the game. "They got it resolved quick enough. It was pretty weird." As for the game, the Dodgers could only round up five hits to score only two -- losing to the Brewers 5-2. At least we fans got to witness Machado's first home run at Dodger Stadium. Per Rowan Kavner at Dodger Insider. Machado gave the fans that stayed something to remember the night by with his ninth-inning homer, but that didn’t make him content in a 5–2 defeat. This Day in Dodgers History: In 1983 Dodger skipper Walter Alston is inducted into the Baseball Hall of Fame. In 1984 Baseball as an Olympic demonstration sport begins its Olympic tournament at Dodger Stadium. In 2004 the Dodgers receive outfielder Steve Finley and backstop Brent Mayne from the Diamondbacks for Koyie Hill, Reggie Abercrombie and southpaw Bill Murphy. They also traded outfield speedster Dave Roberts to Boston for Henri Stanley. In 2006 the Dodgers traded shortstop César Izturis to the Cubs for future Hall of Famer Greg Maddux. In 2008 the Dodgers traded for Manny Ramirez from the Red Sox (including a three team trade with Pittsburgh) for Andy LaRoche and Bryan Morris (who goes to the pirates). Pirates outfielder Jason Bay goes to Boston. Happy Birthday, Pembroke Finlayson & Vic Davalillo!